We’re a research company working actively on teacher evaluation, so we’re interested in these kinds of questions. Should state-of-the-art observation protocols have found more teachers in the “needs improvement” category or at least 5% labeled “ineffective”? We present here an informal analysis meant to get an approximate answer, but based on data that was collected in a very rigorous manner. As one of the partners in the Gates Foundation’s Measures of Effective Teaching (MET) project, Empirical Education has access to a large dataset available for this examination, including videotaped lessons for almost 2,000 teachers coded according to a number of popular observational frameworks. Since the MET raters were trained intensively using methods approved by the protocol developers and had no acquaintance or supervisory relationship with the teachers in the videos, there is reason to think that the results show the kind of distribution intended by the developers of the observation methods. We can then compare the results in this controlled environment to the results referred to in the EdWeek and Times articles, which were based on reporting by state agencies. 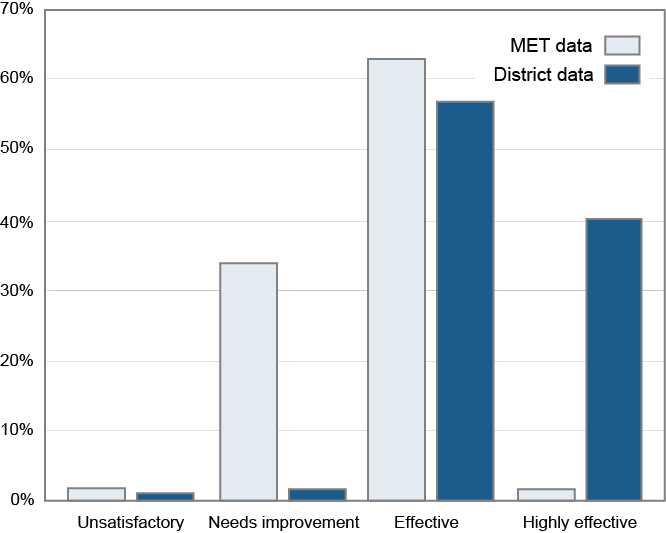 We used a simple (but reasonable) way of calculating the distribution of teachers in the METdata according to the categories in one popular protocol and compared it to the results reported by one of the states for a district known to have trained principals and other observers in the same protocol. We show the results here. The light bars show the distribution of the ratings in the MET data. We can see that a small percentage are rated “highly effective” and an equally small percentage “unsatisfactory.” So although the number doesn’t come up to the percent suggested by Russ Whitehurst, this well-developed method finds only 2% of a large sample of teachers to be in the bottom category. About 63% are considered “effective”, while a third are given a “needs improvement” rating. The dark bars are the ratings given by the school district using the same protocol. This shows a distribution typical of what EdWeek and the Times reported, where 97% are rated as “highly effective” or “effective.” It is interesting that the school district and MET research both found a very small percentage of unsatisfactory teachers. Where we find a big difference is in the fact that the research program deemed only a small number of teachers to be exceptional while the school system used that category much more liberally. The other major difference is in the “needs improvement” category. When the observational protocol is used as designed, a solid number of teachers are viewed as doing OKbut potentially doing much better. Both in research and in practice, the observational protocol divides most teachers between two categories. In the research setting, the distinction is between teachers who are effective and those who need improvement. In practice, users of the same protocol distinguish between effective and highly effective teachers. Both identify a small percent as unsatisfactory. CEO and President of Empirical Education Inc.